This is one of my favorite tasks in recent years. The idea is that we will compare two sets of Peeps. Are there more of one color or the other? In the spirit of Talking Math with Other People’s Kids Month, I report to you conversations other people had about one of these photos, as well as one Tabitha and I had. This is truly, though, a task for all ages. Each of these conversations stems from this photograph. Kelly Darke reports this conversation with Liam, who was 3 at the time. Kelly: Which box has more, the pink or the purple? Liam (3 years old): Pink. Liam: Because I like pink. Kelly presses on with the other photos. Liam offers a color preference each time; sometimes preferring pink and sometimes preferring purple. This is fine. Liam is clearly not interested—or not ready—to make numerical comparisons. He is enjoying having a talk with Mom about comparisons. Another time, he’ll be ready. In the meantime, he has the idea that comparing collections of things is something people talk about. This increases the chances that he will think about comparing collections of things. Luke Walsh reports the following conversation with his five-year-old son, whom we will call Brandon. Luke: Are there more pink Peeps, or purple ones? Brandon (5 years old): The purple is more because it is taller and they ate less. Notice the difference between a 3 year old and a 5 year old. The 5 year old is using evidence. Brandon has two arguments here. “Taller” is not a valid one. You could have one column of three Peeps and the taller argument would give you the wrong answer. It is more sophisticated than “I like pink Peeps” but it’s not really right. This is how ideas develop, though. Height is easy to observe, and it corresponds pretty well to size and age when comparing people. So it is commonly applied to quantities, too. As usual, this partially correct answer can lead to more discussion. Luke could ask, Will the taller arrangement always have more Peeps? “They ate less” is insightful. Brandon seems to notice that the two boxes started with the same number of Peeps, and that if more have been eaten from one box, there are fewer left. The natural follow-up question here is, How do you know fewer purple Peeps have been eaten? 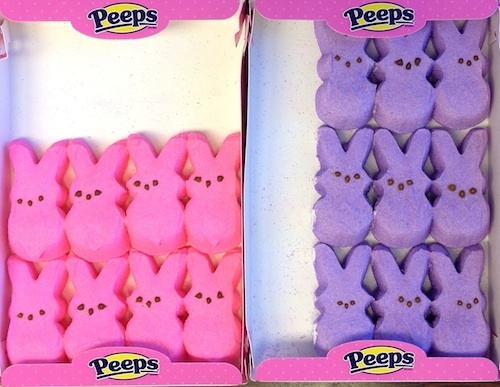 and then Why does fewer purple Peeps being eaten mean there are more purple Peeps? Tabitha, who was barely six years old at the time, used Brandon’s first line of thinking. Tabitha (6 years old): Purple. A follow up task helped to push her thinking a little bit. 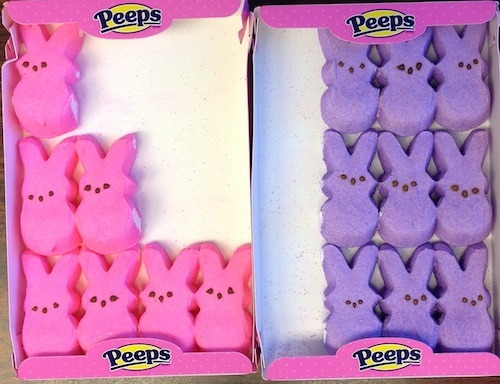 I have used these Peeps photos to encourage discussions of number with fifth graders, with undergraduate education majors, and with middle school math teachers. Good times for all. With the older ones—and in a large group setting—we strive not to mention the actual number of either color of Peeps, and we strive to have multiple ways to describe how we know which is more. You can download a complete set of four comparison photos by clicking on this link [.zip]. You can also just click on the photos below to enlarge them. Your choice. Either way, they are free for you to use to encourage math talk. Please report back what you learn. This entry was posted in Number and tagged 3 years old, 5 years old, 6 years old, compare, peeps. Bookmark the permalink. love this, love Peeps. Would love to find some uses in Alg2/Trig – add a little color and fun! Love the peeps conversation. Would like to hear about other conversations with some of the pictures included since they were not about height.